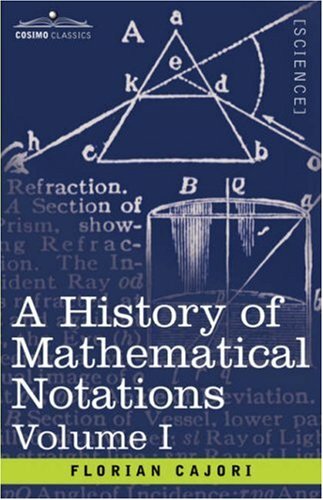 Described even today as "unsurpassed," this history of mathematical notation stretching back to the Babylonians and Egyptians is one of the most comprehensive written. In two impressive volumes -- first published in 1928 and 1929 -- distinguished mathematician Florian Cajori shows the origin, evolution, and dissemination of each symbol and the competition it faced in its rise to popularity or fall into obscurity. Illustrated with more than a hundred diagrams and figures, this "mirror of past and present conditions in mathematics" will give students and historians a whole new appreciation for "1 + 1 = 2." Swiss-American author, educator, and mathematician FLORIAN CAJORI (1859–1930) was one of the world’s most distinguished mathematical historians. Appointed to a specially created chair in the history of mathematics at the University of California, Berkeley, he also wrote *An Introduction to the Theory of Equations*, *A History of Mathematical Notations*, and *The Chequered Career of Ferdinand Rudolph Hassler*.